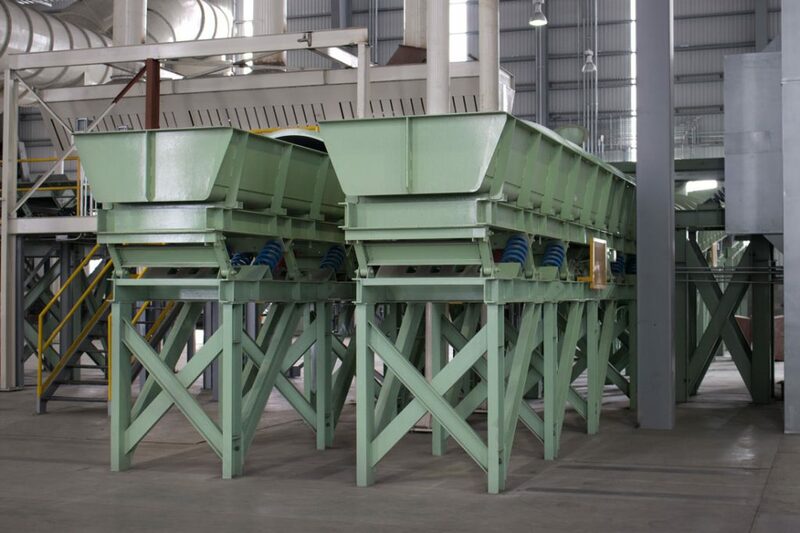 These Vibrating Conveyors are used for conveying hot, abrasive materials like ash, sand and castings. They are also used to convey solids for a wide array of applications, including aggregates, minerals, sand, coal, ash, ore, castings, molds, pharmaceuticals and food products. Standard sizing options are available, as well as, custom-engineered products tailored to fit specific customer requirements. Vibrating conveyors also allow additional processes such as cooling, heating, or coating to be accomplished while transferring materials. 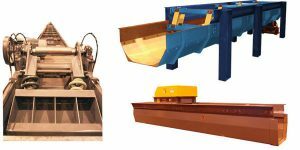 Vibrating pan and trough conveyors can range from light to heavy-duty. Conveyor troughs can be custom finished to handle a wide range of abrasive, hot, toxic, corrosive, or volatile materials. Trough material options include stainless steel, abrasion-resistant steel, and special alloys. Troughs can be finished in a variety of thicknesses, with special coatings as required. Troughs can be designed with covers to be fully enclosed to prevent contamination of product from outside sources as well as minimize dust. Covers can be designed for easy removal to allow operators access as needed. Enclosed conveyor systems can be designed for positive pressure atmospheres using inert gasses such as nitrogen. Conveyor drives can be either brute force or natural frequency, depending on process requirements. Drives can be top, bottom, or side mounted depending on space requirements. Brute force style drives are usually for low conveying rates over short distances. 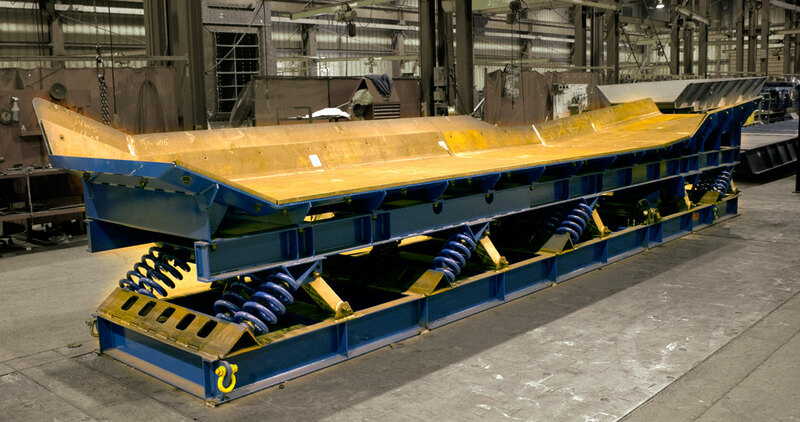 For larger pan and trough conveyors, a natural frequency drive using coil springs and rocker arms are recommended. The design of the natural frequency is a very energy efficient method of conveying. This design allows for 90% of the force required to move the product generated naturally. The remaining 10% is provided using the low horsepower drive system. Conveyor lengths can be up to 400 feet or more for a single unit. 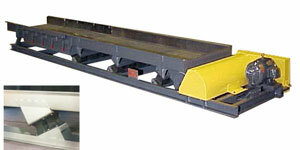 These conveyors can even convey materials around corners or with bends, even up inclines to gain discharge elevation. These vibrating conveyors have isolated bases that are designed to prevent transferring vibration to the support structure or slab. The isolated base make for easy installation using only anchor bolts or welding to embedded steel plates. The Syncro-Flex vibrating conveyor gently throws and catches the material as it is conveyed forward, using these subtle motions to keep material activated and easy to convey. This controlled linear motion is generated via an eccentric drive, and the system is stabilized by a series of rocker arms and coil springs. The spring reactor system matches the resonant frequency of the eccentric drive speed, making the Syncro-Flex a synchronized frequency system. 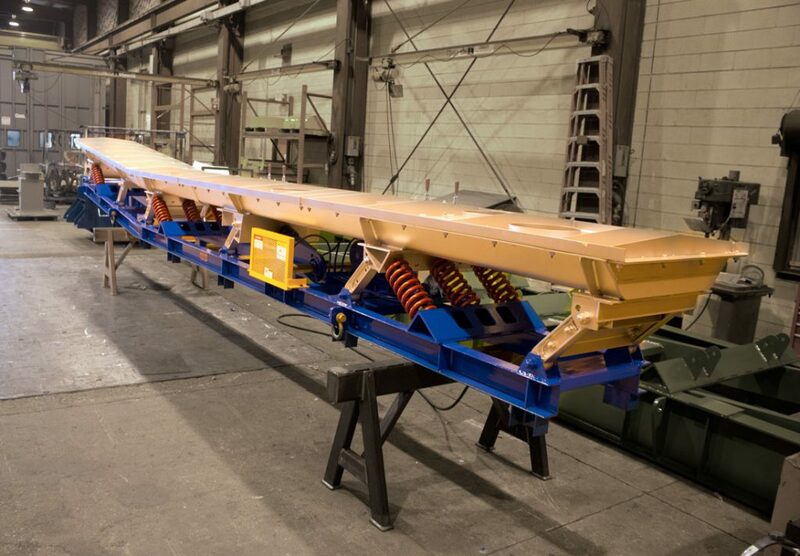 This means that it is a conveyor system which balances accelerating and decelerating forces against forces generated via shear mount deflection. This balanced system ensures that materials move forward at a consistent rate without any destructive stresses in the drive system, and that only a minimum amount of energy is needed to power the vibratory motion. Transported materials are gently and evenly rocked toward their destination. Granular materials are conveyed at an average range of 40-60 F.P.M. Fine mesh materials, and others that are likely to experience interparticle slippage, convey forward at 10-40 F.P.M. These types of vibrating trough conveyors are designed to be installed in pits located below grade. To minimize pit size, all of the Trenchveyor’s machinery exists above the vibratory pan. Drive components are mounted above the floor, adding to the easy accessibility of the design. Units can be customized in several ways, including liner material, the option to design conveyors to run on an incline/decline, and custom sizing. Noise reducing materials help the Trenchveyor run as quietly and non-intrusively as possible. 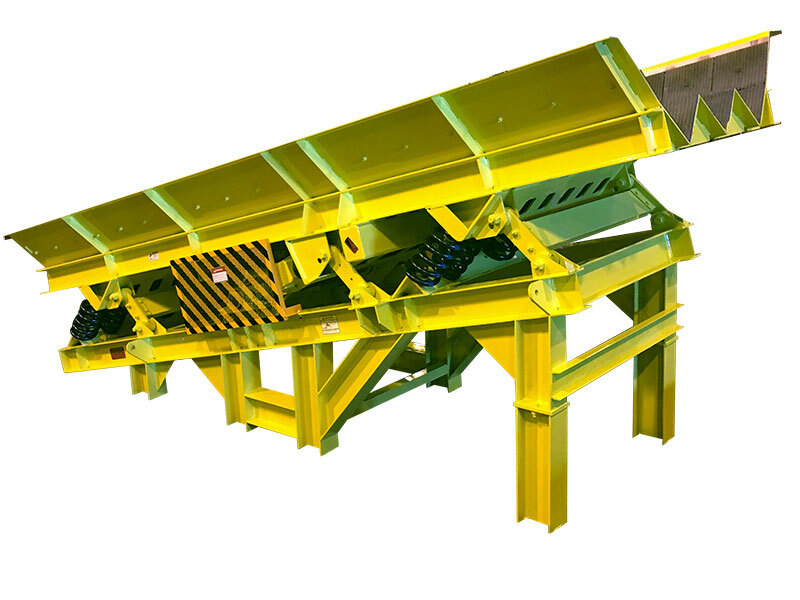 Vibratory rebar conveyor to move the short cuts of rebar away from the shearing table into portable roll away containers.